Toastmasters Fermoy | IF WE CAN DREAM IT, WE CAN DO IT ! President of Fermoy Toastmasters Eilish Ui Bhriain proudly stands beside the Club Banner received in 1970, the visible symbol of almost half a century in which this club has played a unique and outstanding part in the social, cultural and recreational life of our community, touching and enriching the lives of countless people. Long may it so continue! 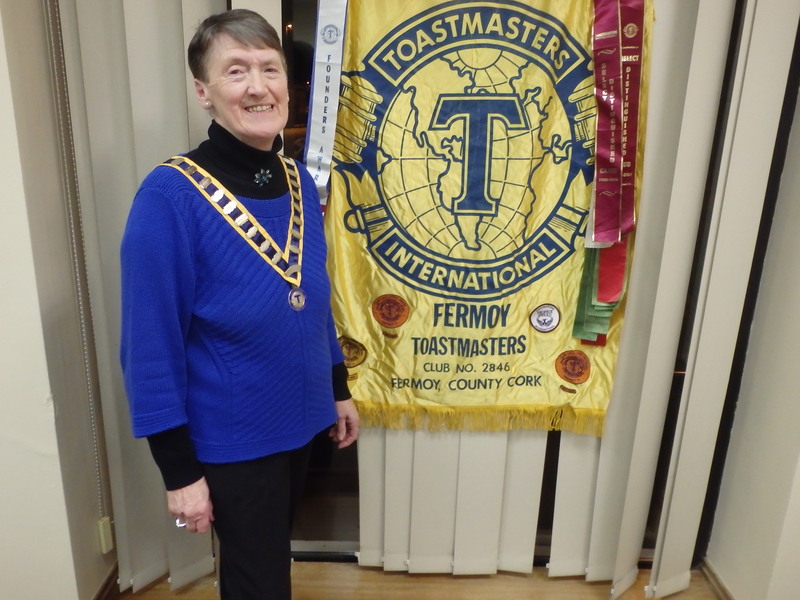 Welcome to the official website of Fermoy Toastmasters. We are a group dedicated to personal growth through enjoyment and pleasure and offering an avenue to a more rewarding and fulfilling life. Our club is a powerful but gentle learning curve marked by humour, warmth, and the thrill of new discovery that brings refreshment and satisfaction to all prepared to give it a try. Part of the global organisation that is Toastmasters International since 1970, for over four decades Fermoy Toastmasters has played a unique and illuminating role in the social and recreational life of our community in which so many have been helped and encouraged to find their full potential and to utilise to the very optimum the full range of their skills and talents, their vision and imagination. By building confidence on success we enable our members and participants to attain a brighter and more lasting happiness in good fellowship and generosity of spirit. Meeting every second Tuesday between the months of September and May at the Youth Centre Fermoy, overlooking the magnificent River Blackwater cascading over the weir and spanned by the familiar but ever impressive stone bridge, in our two hour gatherings we provide an entertaining and stimulating opportunity for people to come together and gain proficiency in speaking in public in an intimate group setting and expressing their meaning with clarity and brevity through short prepared talks and bubbly impromptu topics sessions all serving to encourage quickness of mind and eagerness of thought. Along the way the club provides positive and constructive feedback, developing the skills of listening with deeper understanding and appreciation, gaining experience in the organising of meetings and introduction of speakers, all in an atmosphere of good fun, mutual support and warm friendship. We are the third longest established club in Ireland with a proud and distinguished record of achievement with members past and present gaining the highest speaking honours and awards in these islands. Our meetings are open to everyone and we extend a warm and hearty welcome to all. You will not be asked to speak although if you want to at the opportune moment, we would be ever so pleased to hear from you. We would be delighted to meet you and we promise a memorably pleasant and enjoyable evening. All of us who have stayed as members over the years know that feeling of elation you get after having participated in these brilliant activities that keeps us coming back time and again for more. We hope you come as often as you wish and if you decide that you would like to join us, we promise you the sky is the limit.